All patients will be guaranteed a GP appointment within 48 hours, Labour leader Ed Miliband pledged at a conference in Manchester last night. The 48-hour GP pledge is one that the last Labour government brought in - and the Tories scrapped in 2010. It comes as part of a renewed Labour focus on the NHS - traditionally an area of strength for Labour. MPs are visiting threatened inner city surgeries today, and a party political broadcast on the NHS follows tonight. Under this government the number of people who see a GP within 48 hours of contact has halved from 80% to 40%, according to Labour, with a quarter of people waiting over a week. Miliband said last night it was a ‘scandal’ that people were waiting so long. The policy would also allow same-day telephone and emergency consultations, and make it easier for patients to book in advance to see a preferred GP. Labour point to GP patient surveys showing that 77% of patients could see a preferred GP in 2009, but its now 63%. Labour said they would fund the pledge - costed at £100million - using money saved from scrapping some of the bureaucracy around operating an NHS market, including Monitor’s role in enforcing competition, overlapping quangos, and the use of outside consultants. Miliband suggested this would allow an extra 3 million GP appointments a year, relieving pressure on other parts of the NHS including A&Es. Labour also cite studies showing that a 5% increase in patients seeing their preferred GP could save the NHS £375 million a year by reducing unnecessary hospital admissions. The figure has raised a few eyebrows as too low to fund that many appointments, with new Royal College of GPs Chair Maureen Baker suggesting the shortfall in GP funding was more like £3bn. She said the Labour plans were "a welcome start" but "not anywhere near enough". 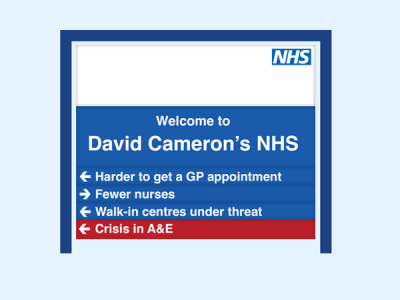 "GP funding has been cut by nearly £1bn by this government, with a shortage of 10,000 GPs. The savings from scrapping the market are a huge underestimate. If Ed Miliband was more bold, and scrapped the market and abolished PFI, billions could be saved to spend on bolstering general practice and frontline care." Experts including the Health Select Committee and Royal Colleges have repeatedly challenged the claim that increased private provision was a cost effective way of bringing down waiting lists. Pressure on GPs is also highlighted today as Labour shadow health secretary Andy Burnham visits Jubilee Street practice in Tower Hamlets today. The highly regarded, award-winning practice is one of 98 that NHS England has identified as at threat of closure due to government funding changes. Amongst the 100 practices in imminent danger are 5 in Tower Hamlets and 12 in Hackney - around a quarter of Hackney’s GP surgeries. These are some of the poorest areas in the country. The new system has been presented by NHS England as making GP funding “fairer across the board”. Early reports on the funding changes highlighted the risk to remote rural GP practices. But it has emerged that inner City practices are amongst the hardest hit by funding changes. Virginia Patania, Practice Manager at Jubilee Street Practice told OurNHS that the new payment system “rewards practices with older patients, and strongly disadvantages practices with younger, sicker populations due to deprivation factors". To make up the shortfall from the loss of the Income Guarantee would require the Jubilee Street practice to sign up 1000 extra patients. GPs at the practice earn around £35,000 a year and have already taken a £250 a month pay cut. As well as the abolition of the Minimum Practice Income Guarantee, changes include a reduction in ‘quality’ payments and the loss of payments to provide enhanced services like more preventative and home-based services. The combination of such changes has hit some well-regarded practices hard. A wider squeeze on general GP funding - at a ‘historic low’ according to the Royal College of GPs - meant that many practices have become increasingly reliant on such payments to stay afloat. “Practices of good standing and reputation are at risk of shutting, and are taking advice around how to do so, within the next 12-16 months”. Richard Vautrey, deputy chair of the BMA’s GP committee, says that the 98 surgeries identified as at risk by NHS England are just ‘the tip of the iceberg’. Both the BMA and Royal College of GPs have recently launched campaigns to defend General Practice in England and call for greater investment. Lower Clapton Group Practice in Hackney will lose £250,000, the Hackney Gazette reports. Neighbouring Well Street practice has already axed its blood collection service and cut GPs pay. The Hackney Gazette asked the Department of Health if an emergency fund might become available, but was referred to NHS England - who referred it back to the Department of Health. "The danger is if we keep quiet and practices fold ... all that would trigger is an NHS England opportunity to tender, to see what other private providers could come and take us over." At the meeting Ron Singer, head of the Medical Practitioners Union, called for GPs to a "build a Lewisham-style campaign" to save GP surgeries. Burnham’s visit to Jubilee Street today takes place ahead of a parliamentary debate organised by Poplar MP Jim Fitzpatrick this afternoon to force ministers to answer questions on the threat to East London GP practices. Meanwhile nurse shortages have also been in the spotlight. A report out this week from regulator NICE recommends that, in the wake of the failings of care at Stafford Hospital, wards should have a maximum ratio of 8 patients to 1 nurse. Currently the NHS is around 20,000 nurses short, campaigners believe. Jeremy Hunt has yet to comment on whether the government will implement the report and whether recommendations will be compulsory. There have been revelations of shocking levels of understaffing on wards. The RCN in November found situations where only one nurse was in charge of wards with 21 beds, including at Hinchingbroke - the first NHS hospital in the UK to be wholly ‘franchised’ to a private company. Chief quality inspector David Prior (former MP and deputy Chair of the Conservative Party) controversially suggested earlier this year that other struggling NHS hospitals should follow the Hinchingbroke model. But the owners, Circle (backed by Tory donors) have been repeatedly criticised for cutting corners on patient care in an attempt to turn the hospital into a profitable enterprise.